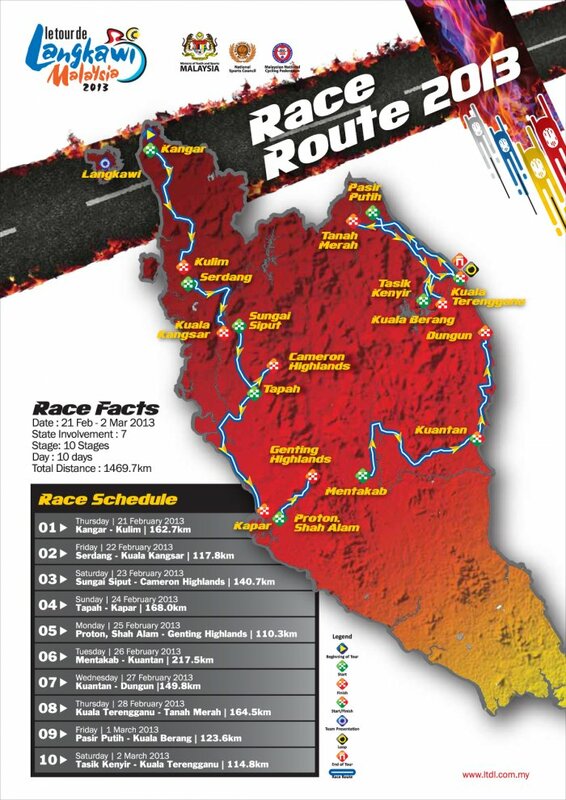 The 18th edition of Le Tour de Langkawi from February 21 to March 2, 2013 is set to be marked not only with a return to it\'s legendary birthplace, but also with a more challenging route that includes climbs up both Cameron Highlands and Genting Highlands. This will be the third year the race, which again will be sanctioned by the International Cycling Union (UCI) as a 2.HC (hors category) race on the UCI Asia Tour calendar, will be organised by the Ministry of Youth and Sports, via the National Sports Council (NSC) in association with the Malaysian National Cycling Federation (MNCF). Le Tour de Langkawi 2013 will feature 10 gruelling stages, set to be kicked off with a team presentation and prelude on the island of Langkawi on February 20.